4,4′-Bis(N-carbazolyl)-1,1′-biphenyl (CBP), is one of the most widely-used host materials for efficient phosphorescent organic light-emitting diodes with high hole mobility. This is due to its electron-rich property from two carbazolyl units. It has been demonstrated that CBP can efficiently host green, yellow and red phosphorescent emitters with triplet energies smaller than that of CBP (ET = 2.6 eV) . 1H NMR of 4,4′-Bis(N-carbazolyl)-1,1′-biphenyl (CBP) in CDCl3. 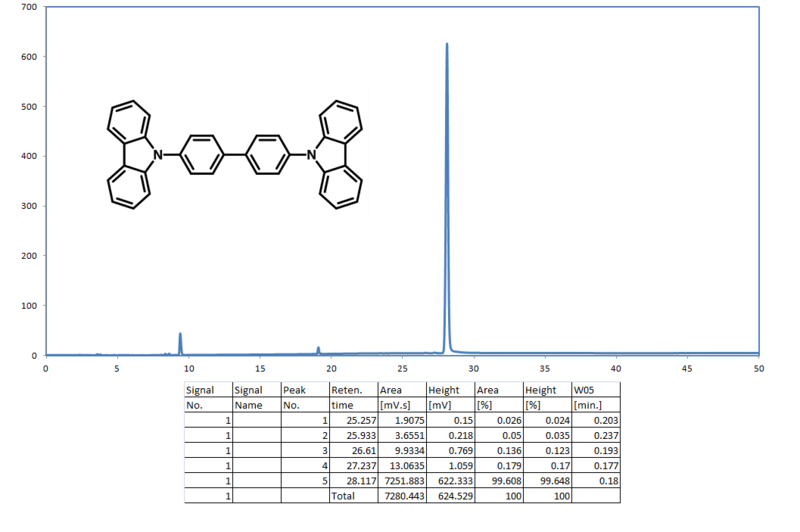 HPLC trace of 4,4′-Bis(N-carbazolyl)-1,1′-biphenyl (CBP). Transient analysis of organic electrophosphorescence: I. Transient analysis of triplet energy transfer, M. Baldo et al., Phys Rev B, 62: 10958–10966 (2000). Highly efficient single-layer dendrimer light-emitting diodes with balanced charge transport, T. D. Anthopoulos et al., Appl. Phys. Lett. 82, 4824 (2003). White organic light-emitting devices with a bipolar transport layer between blue fluorescent and orange phosphorescent emitting layers, P. Chen et al., Appl. Phys. Lett. 91, 023505 (2007). Highly Efficient and Low-Voltage Phosphorescent Organic Light-Emitting Diodes Using an Iridium Complex as the Host Material, T. Tsuzuki et al., Adv. Mater., 19, 276–280 (2007). Highly simplified phosphorescent organic light emitting diode with >20% external quantum efficiency at >10,000 cd/m2, Z. B. Wang, Appl. Phys. Lett. 98, 073310 (2011); http://dx.doi.org/10.1063/1.3532844. Highly efficient and color-stable white organic light-emitting diode based on a novel blue phosphorescent host, Q. Wu et al., Syn. Metals 187, 160– 164 (2014); http://dx.doi.org/10.1016/j.synthmet.2013.11.010. Light outcoupling efficiency enhancement in organic light emitting diodes using an organic scattering layer, R. Grover et al., Phys. Status Solidi RRL 8 (1), 81–85 (2014). DOI: 10.1002/pssr.201308133.